Line of old railway track . Extraction of clay is a messy business! As the clay pits got deeper the problems of transporting clay back to the brickwork through Wealden clay became more difficult. Wares overcame this problem by installing a narrow gauge railway with a main track down the site to the Eastern clay workings and branch lines into the two deep pits. A 20hp twin Ruston loco provided the engine power pulling up to eight trucks, each loaded with about one ton of material. Because this was a narrow gauge railway the engine driver sat sideways on the Ruston loco. To ensure the stability of the track it was laid on a bed of broken tiles and other terra-cotta aggregate discarded, no doubt from the main brickwork's. The remains of the raised track-bed is still visible across the top, main events meadow. 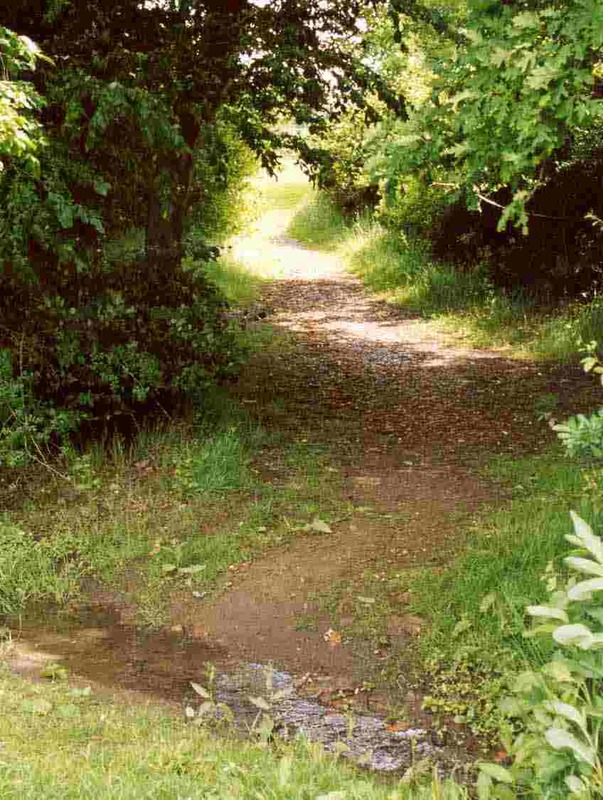 It then follows a grass path down the site, passing a small copse before cutting through bushes to the stream. 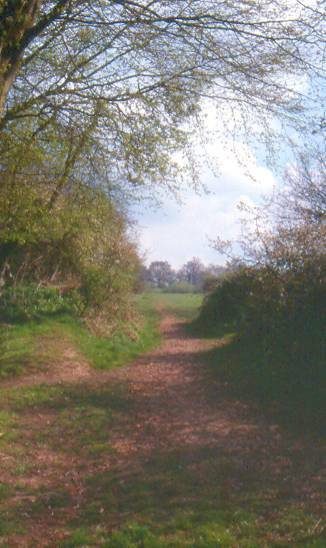 Here the path is littered with broken tiles from the old track-bed. The stream is seasonal but the area is damp enough all the year round to support the growth of watercress just upstream from this picture. During the Uckfield Festival celebrations in 2003 this area provided the backdrop to the Uckfield Youth Theatre's Shakespeare production of Midsummer Nights Dream - from industrial backdrop to romantic setting!